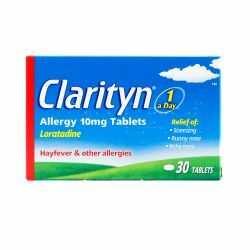 Piriton Allergy is a yellow tablet which contains the active ingredient Chlorphenamine. Chlorphenamine is an antihistamine which can help to relieve the symptoms of some allergies and itchy skin rashes. It can also be used to treat the itchiness, redness, swelling, tenderness and irritation that can be caused by hayfever or nettle rashes and hives. 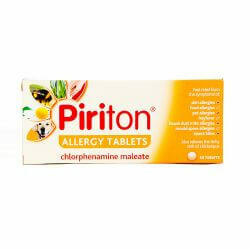 Piriton Allergy is suitable for adults and children over 6 years old and is available in packs of 30 and 60. Piriton Allergy should be kept out of sight and reach of children and should not be stored above 30 degrees celcius. 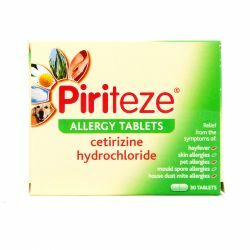 Piriton Allergy are for oral use only and should be taken with water. The recommended dose for adults and children over 12 years old is to take one tablet every 4 to 6 hours when required. Do not take more than 6 tablets in 24 hours. For children aged 6 to 12 years, the recommended dose is half a tablet every 4 to 6 hours when required. Do not take more than 6 half tablets in 24 hours. Children under 6 years old should not take this medicine. If you take too many tablets, contact your doctor or casualty department. Do not drive if you have taken too many tablets. If you forget a dose, take one as soon as you can, unless it is nearly time to take the next one. Do not double dose. The active ingredient in Piriton Allergy is chlorphenamine maleate. Other ingredients include lactose, maize starch, yellow iron oxide (E172), magnesium stearate and water. Piriton Allergy should not be taken if you are allergic to any of the ingredients in the medicine. You should not take the tablets if you have had an allergic reaction to any other antihistamines or if you have taken monoamine oxidase inhibitors in the last two weeks. You should speak to your doctor or pharmacist before taking these tablets if you have very high blood pressure, heart disease, epilepsy, glaucoma, enlarged prostate, liver disease, bronchitis, asthma or bronchiectasis or if you have been told by your doctor that you have an intolerance to some sugars. You should avoid drinking alcohol with Piriton. You should make sure to mention if you are taking any other medicines, including medicines obtained without a prescription. You should speak to your doctor or pharmacist if you are pregnant or breast-feeding before taking these tablets. As with all medicines, Piriton Allergy can cause side effects, although not everybody gets them. You should stop using Piriton immediately if you notice any signs of an allergic reaction. The most common side effect is drowsiness. If you feel drowsy after taking Piriton, you should not drive or operate machinery. You should stop taking Piriton and speak to your doctor if you experience liver problems, anaemia or unexplained bleeding or bruising. Other side effects include difficulty concentrating, feeling tired, dizziness, headache, blurred vision, loss of appetite, indigestion, feeling or being sick, diarrhoea, tummy pain, dry mouth, difficulty passing water, low blood pressure, changes in heart rhythm, chest tightness, thickening of phlegm, skin peeling, itchy rash, sensitivty to the sun, ringing in the ears, twitching, muscular weakness, abnormal co-ordination, confusion, excitability, irritability, low mood or nightmares. Children may become excited.